The EMU PPI was a tick weaker in April as it rose by 0.1% after gaining 0.2% in March. The EMU PPI generally (but not totally, consumer goods were an exception) accelerated from 12-months to 6-months then decelerated from 6-months to 3-months. Inflation was generally lower over three months than over 12-months with a very minor exception of capital goods. The clearest overview statement we can make about inflation in the Euro-Area and in Europe generally is that inflation is moderate-to-low and remains stable. Among the three sectors of capital goods, consumer goods and intermediate goods we observe that capital goods price trends are exceptionally stable around the 1% mark. Consumer goods inflation has moved around a bit more but over the past year it has averaged well-below 1% over various horizons. Intermediate goods inflation has been over the 2% mark on several of its key horizons and this is the series most affected by commodity prices and oil. But over the past two months intermediate prices have only ticked higher and now oil prices are getting weaker on global markets reversing some of their past gains. The ECB targets consumer inflation (HICP measure) but at 2% the PPI is very well behaved. The chart fairly depicts the inflation bump up and run off by sector. But countries have had different and separate experiences. 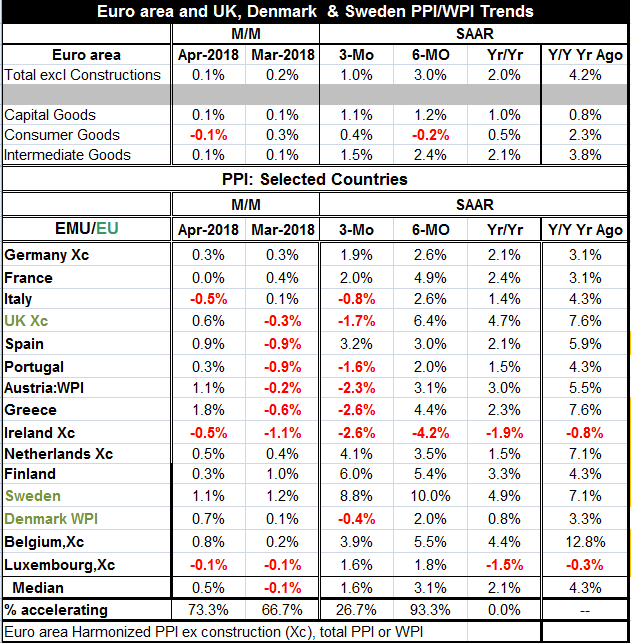 If we look at a sample of fifteen European countries (12 of them EMU members) we find that despite equal increases of 0.1% in the PPI in each of the last two months inflation is accelerating in 73% of these reporters in April compared to March. However, over three-months inflation accelerates compared to 6-months in only 27% percent of the countries, it accelerates over 6-months compared to 12-months in 93 percent of the countries but it accelerates in 12-months compared to the year-over-year pace of 12-months ago in no country. On balance year-over-year inflation is moderate to low. But over six months it generally picks up. Then, over three-months, inflation heads lower. In fact over three-months inflation is actually negative in seven of these reporting countries- nearly half of them. The price level is falling on all horizons in Ireland. It is rising on all horizons in Germany, France, Spain, the Netherlands, Finland, Sweden and Belgium. Sweden, Finland and Belgium are three of the most consistent inflation prone countries in the group. Besides Ireland, among the least inflation prone are these countries: Denmark, Luxembourg, Italy and Portugal. This would be a very strange list of least inflation prone countries that no one would have believed prior to the formation of EMU. In terms of changes, inflation is falling the most consistently in Austria, the UK and Portugal. It is rising the most consistently and rapidly in Sweden, Denmark and Luxembourg. On balance the PPI seems very steady and moderate. There are only hits of pressure cooking in a collection of Nordic countries. Perhaps the greater risk now is from trade tensions. As of this writing those tensions are not spilling over into markets. But concerns are palpable and the US trade actions are being prepared to be met by countermeasures in Europe. And while there is a focus on the higher prices that tariffs will bring the real concern is the risk that the imposition of tariffs could untrack growth and that would do the opposite and reduce inflation along with growth. It’s no wonder that markets do not know what to do. In this instance markets seem to be betting that cooler heads will prevail and that all of the threats and jockeying for position will lead to a less damaging, more compromised, solution in the end. But no one knows. The fact is that the US has been the freest and fairest trading nation among major economies. That has led to the persistent and protracted trade and current deficits in the US that Donald Trump wants to expunge. Yet US major trading partners have come to look at the status quo as something that is righteous even though it isn’t and has had benefits that have favored them for many years. The fact that the international adjustment mechanism (here I mostly mean exchange rates and exchange rates movements) have never worked to put the US current account back in balance (or other nation’s surpluses back in balance…) is ample evidence that a new sort of solution may be needed and Mr. Trump has chosen tariffs as the great equalizer. I don’t think in a fair assessment of WTO rules on how the US Vs others have comported themselves including a fair appraisal of exchange rate management and commercial policy you really can fault the US. Germany has the highest current account surplus ratio to GDP in the world among developed economics. And it wants to brand the US, with massive deficits as an unfair trader? Where’s Waldo? Where is the truth? Germany imposes tariffs on US auto exports to Germany. Please!! Come to your senses! The time for the euro to rise and for Europe to drop restrictions on US exports is long past due. Donald Trump’s national security pretext for restrictions on imports is a rule dodge but one that is hard to disallow. The US has a much stronger basis for action than that. Europe is being a cry baby. There is no crying in international trade. Time for action not tears.